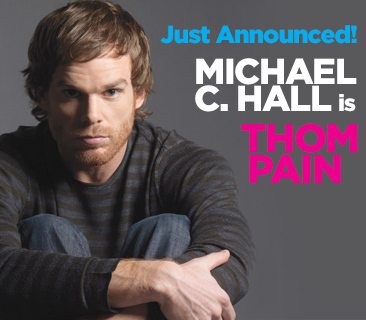 THOM PAIN (based on nothing) by Will Eno, starring Michael C. Hall, at Signature Theatre Oct. 23-Dec 2, 2018 | The Drama Book Shop, Inc.
New York's Signature Theatre. October 23 through December 2, 2018. Drama Desk Award-winner Will Eno, the first writer to complete the Residency 5 program, returns to Signature for his first Legacy production with Thom Pain (based on nothing), directed by Oliver Butler (Obie and Lortel Award-winning The Open House). Called “a small masterpiece” by The New York Times and “one of the best monologues I’ve ever seen” by The Guardian, this surreal and very real one-man show follows Thom Pain as he desperately, and hilariously, tries to save his own life…or at least make it into something worth dying for.